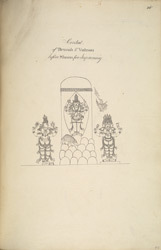 Pen and ink drawing of Brahma, Vishnu and Shiva, from the Minakshi Sundareshvara Temple in Madurai, from an 'Album of 51 drawings (57 folios) of buildings, sculpture and paintings in the temple and choultry of Tirumala Nayyak at Madura. c.1801-05', by an anonymous artist working in the South India/Madurai style, c. 1801-1805. Each picture is inscribed with a title and a number in ink. Construction of the Minakshi Sundareshvara Temple complex was made possible by the wealth and power of Tirumala Nayak (1623-1659). He was the most prolific builder of a long line of Nayaka kings, a dynasty who ruled a large portion of Tamil country in the 16th and 17th centuries. The complex contains two main shrines; one dedicated to Shiva and one to his consort Minakshi, an ancient local divinity. Each shrine is set within its own walled complex containing several subsidiary shrines, mandapams (assembly halls), courtyards and galleries. Every available space is heavily ornamented with magnificently sculpted figures of Hindu deities and portrait sculptures of the Nayaka rulers. This drawing is of a detail on a carved column that represents Shiva appearing out of Lingodbhavamurti, a pillar of fire that appears to span neither the world nor the sky, and has neither a beginning nor an end. The myth associated with it tells of a time when Vishnu witnessed the fiery manifestation and was awestruck by its power. On an impulse, he left to look for the origin of the pillar of fire. He descends into the bowels of space, many worlds below the earth but he cannot reach the end of the pillar. Brahma begins a similar adventure and soars into the sky, beyond the clouds and the known worlds, but he too fails to discover the crown of Lingodbhavamurti. The point being, that even gods cannot view the form of formlessness, something that has neither a beginning nor an end.